The pre-installation design of module magnet makes the maintenance easier. 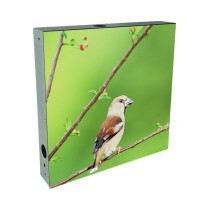 Just gently twisting screws behind the cabinet back cover, you can maintain easily. The design of the whole maintenance gives you the most considerate and quick maintenance experience. High-definition image and wide-angle vision give you a vivid picture which is suitable for all kinds of occasions, such as the splendid hall, innovation technology seminars, star talent game, televison broadcast live and so on.